Huge snowstorms have hit the Alps over the past week, causing massive disruption and a number of deaths. In the biggest snowfall of the season airports have closed, ski resorts have been cut off, roads blocked and there have been a number of fatal avalanches. Thousands of holidaymakers have had plans thrown into chaos and forecasters say there is more snow to come. Geneva airport was closed on Sunday, causing severe problems on one of the main transfer days for holidaymakers. "The runway was so slippery it made standard braking impossible," says Philippe Roy, a spokesman for the airport. "There was no option but to close the airport." It was shut for eight hours - the longest the airport has been closed for more than 20 years. One hundred and sixty five flights were affected and there was a build up of hundreds of coaches. Some flights were diverted to Lyon airport, which was then also closed because of heavy snowfalls. Others went to Zurich, which was relatively unaffected. Those travelling back to the UK by train fared little better, as the snow train which runs from Bourg St Maurice, in France, could not leave due to the danger of rock falls. Passengers slept on the train in the sidings, while those at later stations were taken by bus to Chambery to catch the TGV. 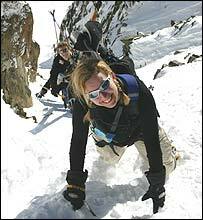 "In the 15 years I have worked in the Alps this has been one of the worst weekends I can remember," says Katie Joly, the manager for France and Switzerland for Crystal Holidays. "We managed to get everyone home in the end, but it was a struggle." Many ski resorts have also been cut off. An avalanche fell across the road leading up to the French resort of Tignes, while in the Swiss resort of Verbier a coach skidded across the mountain road and blocked the road in both directions for several hours. Fortunately no one was hurt in either incident. Other resorts including Avoriaz and Les Arcs were cut off as the authorities closed the roads for fear of avalanches. The storm has been raging since last Wednesday, with more than a metre falling in many resorts. Three people died in the Austrian resort of St Anton when they were buried under an avalanche, two other skiers are missing, presumed dead, in Crans Montana and a German snowboarder died in Gargellen. There are unconfirmed reports of at least another five deaths. In Verbier, a man was swept more than 200m down the mountain, but was able to call the rescue services using his mobile phone from under the snow. "It is a miracle he is alive," says Pierre-Yves Deleze, marketing manager of Verbier. "It took the rescuers three hours to locate him under a metre of snow, but he was caught in an air pocket, so he survived." In the French resort of Val d'Isere, children have been urged not to play near buildings as the snow could slide off the rooftops and bury them. The high winds and huge amounts of snow have closed many of the ski-lifts, but once controlled avalanches have been set off, the skiing conditions should be superb. 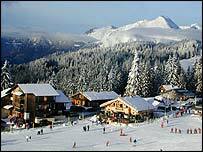 "It's a shame we haven't seen the sun but the snow is simply fantastic," says British skier Anneke Driscoll, on holiday in the French resort of Les Gets. "You always worry about whether there will be enough snow, but I have never seen so much. I just hope they close the road so we can't get home." This weekend, the most prestigious event in the racing calendar, The Hahnenkamm, which is held in Kitzbuhel in Austria, was cancelled because of too much snow. It is only the fifth time it has been cancelled in its history. Hundred of volunteers tried to clear the snow but it came down faster than they could clear it. "It was a great shame the race was called off," says Cate Langmuir, the editor of the Good Ski Guide, who was in Kitzbuhel for the race. "But the party went on anyway and we managed to get some great skiing in." Forecasters say the snow has now eased slightly, but there is more to come later in the week.